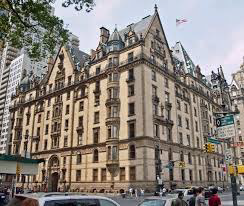 The Dakota | Custom & Private New York Tours, Inc. The Dakota is New York’s first Luxury apartment building. What did Mr. Isaac Singer have do to with this building? Residents included Yul Brenner, Judy Garland, Leonard Bernstein, Lauren Bacall, John Lennon, Mark Twain, Truman Capote, Andy Warhol, Rex Reed and Isadora Duncan and countless others. Take a virtual tour of an apartment; got a spare $28 million or more? This German Renaissance beauty is considered one of the “five best buildings” in New York City. Oh yes, one more thing. Why is it called The Dakota? You’ll find out.